High-Performance table tennis shoe of premium quality. The successful original model in a new design with enhanced cushioning effect and grip. The unique design incorporating an especially non-slip sole and the use of a higher percentage of natural rubber ensure even better grip. The upper nylon mesh material allows the foot to breathe and is extremely comfortable to wear. 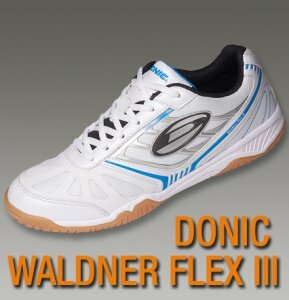 Although the DONIC Waldner Flex III is light and flexible, the shoe retains perfect balance, even with the most demanding of movements. The orthopaedic shock absorbing EVA-middle sole with cushioning of the innersole allows for maximum comfort.